LASC > Resources > Resources For Teachers > Introduction to Latin America > What is Latin America? 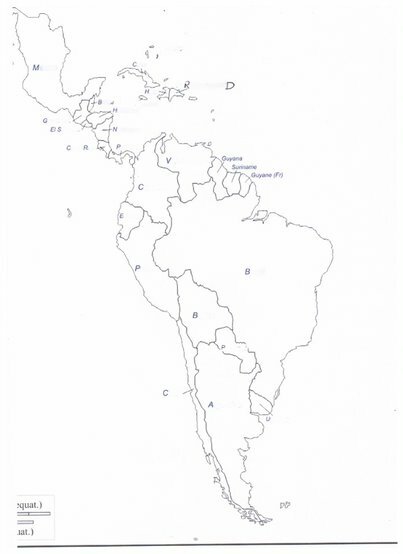 To identify Latin America on the map and the countries that form it. Divide the class into groups of three or four and give each of them a blank map of Latin America. Ask them to fill in the map with the names of the countries and, if they know them, the capitals. The team that has the most correct countries is the winner. Go through the concept of Latin America with your students. Make them see the difference in Spanish between Latinoamericanos, Americanos y Estadounidenses. Ask students to name the countries in Spanish. They can name the capitals as well (La capital de Perú es Lima). Ask students to think of one of the countries and say where it is on the map (in Spanish). For example: Mexico está al Norte de Guatemala y al sur de los Estados Unidos; o Brasil es el país más grande de Sudamérica. You can practice here the nationalities from the different countries. Ask students to do the same with European countries, its capitals and nationalities.